Come along to our Chanting & Drumming Workshop for an exciting opportunity to take part in our interactive procession on the 5th March. 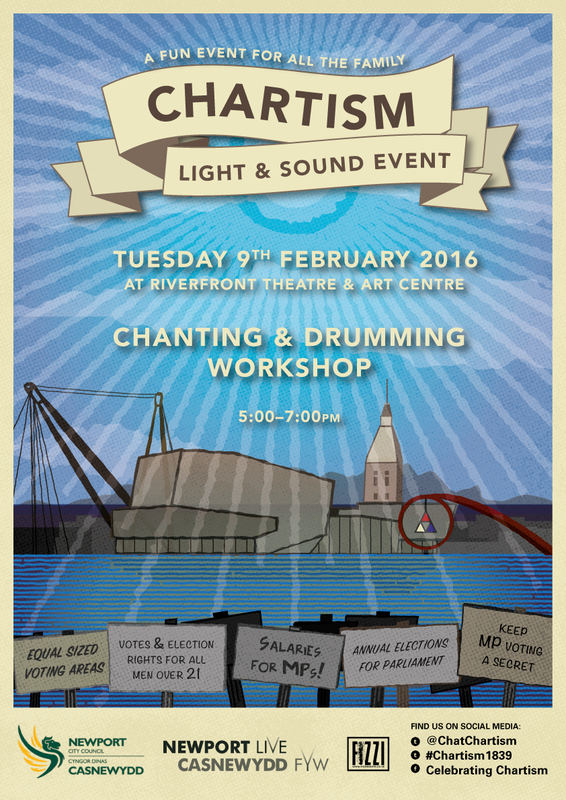 We will provide fun, vibrant workshops where the history of chartism can be explored, and songs, chanting and music can be created which will re ect this revolutionary period in Newport’s history. The workshop is suitable for all ages and are free to attend, and all percussion instruments will be provided. Newport Live has commissioned Fizzi Events, a creative productions organisation to create a participatory, free event under the ‘celebrating Chartism’ banner which will take place between 4-7pm Saturday 5th March, starting at Westgate Square, onto John Frost Square and then finishing with a light and sound show outside the Riverfront Theatre.